A furnace works to keep a home warm in the winter and plays a critical part in the operation of an air conditioning system. Furnaces produce heat through the combustion of natural gas in the furnace's burner. The heat produced from this process then passes through a heat exchanger. Air from your home's return air ducts is blown over the heat exchanger, thus warming the air. The furnace's blower then blows the warmed air into the ductwork, which carries and disperses the warmed air throughout the home. During warmer months, the blower inside a furnace continues to circulate return air throughout the home--only this time, the return air has been cooled by being blown over the indoor coil portion of the home's split-system air conditioning system. 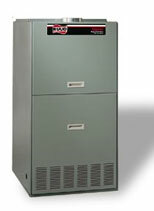 The condensing coil is typically installed on top of the furnace. The evaporator coil is a piece of a equipment that is useful in sending cold air throughout the ductwork located in your home.